In this study, two new structures of single-phase hybrid multilevel inverter are proposed for both symmetrical and asymmetrical configurations that can be employed in drives and control of electrical machines and connection of renewable energy sources. The proposed configuration uses a less number of semiconductor devices and DC sources as compared with conventional and newly developed topologies which lead to a reduction in cost and installation area. The proposed topology poses a vital advantage of self-voltage balancing of its capacitor voltage regardless of load type, load dynamics and modulation index. Also, the proposed topology is expanded in a cascaded fashion which reduces the complexity and improves the performance significantly. A wide range of comparison is done with conventional and newly developed topologies to show the superior performance of proposed topologies regarding a total number of switches and DC sources. The multi-carrier pulsewidth modulation strategy is adopted for generating switching pulses for respective switches. A laboratory prototype is developed for testing the performance of the proposed topology for 9-level and 17-level inverters. This paper proposes two new hybrid topologies of symmetrical and asymmetrical MLI with the self-voltage balancing of its capacitor voltage and with a reduced number of devices. For obtaining the maximum number of output levels in asymmetrical configuration, a new algorithm is proposed. The proposed topologies have been tested experimentally for 9-level and 17-level inverters under different switching frequencies. For effectively demonstrating the self-voltage balancing phenomenon of capacitor voltage, the proposed topologies have been tested under non-linear load, reactive load, under different modulation index and different load transition. A wide range of comparison is drawn between the proposed topologies, the conventional and the newly developed topologies which show that the proposed topologies require the least number of switches and DC sources as compared with other topologies. Aiming at effective power management in microgrids with high penetration of renewable energy sources (RESs), the paper proposes a simple power control for the so-called second-generation, single-phase electric springs (ES-2), that overcomes the shortcomings of the existing ES control methods. By the proposed control, the unpredictable power generated from RESs is divided into two parts, i.e. the one absorbed by the ES-2 that still varies and the other injected into the grid that turns to be controllable, by a simple and accurate signal manipulation that works both at steady-state and during RES transients. It is believed that such a control is suitable for the distributed power generation, especially at domestic homes. In the paper, the proposed control is supported by a theoretical background. Its effectiveness is at first validated by simulations and then by experiments. To this purpose, a typical RES application is considered, and an experimental setup is arranged, built up around an ES-2 implementing the proposed control. Testing of the setup is carried out in three steps and proves not only the smooth operation of the ES-2 itself, but also its capability in running the application properly. Fig. 1. Topology of ES-2 and associated circuitry. Fig. 2 Simulation waveforms under different variations of the input active power. (a) From 1.6kW to 1.1kW and then back to 1.6kW @ VG=230V. (b) From 8kW to 2kW and then back to 8kW @ VG=200V. (c) From 8kW to 4kW and then to 2kW @ VG=200V.. Fig. 4. Simulation waveforms before and after grid distortion. (a) Results of PLL. (b) Results of active and reactive power of ES system. 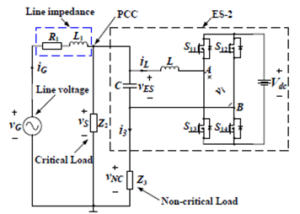 The input active and reactive power control is proposed for the purpose of practical application of ES-2 in this paper. An overall review and analysis have been done on the existing control strategies such as δ control and RCD control, revealing that the essences of the controls on ES-2 are to control the input active power and reactive power. If being equipped together with the distributed generation from RESs, the ES-2 can manage the fluctuated power and make sure the controllable power to grid, which means that the ES-2 is able to deal with the active power captured by MPPT algorithm. Simulations have been done on the steady and transient analysis and also under the grid anomalies, validating the effectiveness of the proposed control. Three steps have been set in the experiments to verify the three typical situations and namely the active power generated by the GCC from RESs are, 1) more than; 2) less than; 3) the same as the load demand. Tested results have validated the proposed control. Cheng and Y. Zhu, “The state of the art of wind energy conversion systems and technologies: Areview,” Energy Conversion and Management, vol. 88, pp. 332–347, Dec. 2014. Sotoodeh and R. D. Miller, “Design and implementation of an 11-level inverter with FACTS capability for distributed energy systems,” IEEE J. Emerging Sel. Topics Power Electron., vol.2, no. 1, pp. 87–96, Mar. 2014. Wang, and D. N. Truong, “Stability enhancement of a power system with a PMSG-based and a DFIG-based offshore wind farm using a SVC With an adaptive-network-based fuzzy inference system,” IEEE Trans. Ind. Electron., vol. 60, no. 7, pp. 2799–2807, Jul. 2013. Zhang, X. Wu and X. Yuan, “A simplified branch and bound approach for model predictive control of multilevel cascaded H-bridge STATCOM,” IEEE Trans. Ind. Electron., vol. 64, no. 10, pp. 7634–7644, Oct. 2017. Electric Spring is an emerging smart grid technology, which can provide voltage support to weakly regulated system. 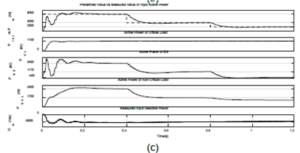 This paper studies the effect of load variation on the performance of electric springs. Two different single phase circuits with intermittent power supply have been simulated for the study – with one electric spring and with two electric springs. The loads considered are linear and are identical. Results obtained in MATLAB/Simulink environment show that line voltage is regulated by electric spring irrespective of variation in load. A brief comparative study is done between the simulation results obtained from the two circuits to observe the effect of the additional electric spring. This study tests the effectiveness of electric springs in a circuit designed to be more realistic, i.e., when the loads are not ON all the time and multiple electric springs are distributed all over the grid. This paper demonstrates the effects of load variation on the performance of ES. From the simulation results, it can be noted that, for boosting mode of operation, the ES can regulate the line voltage at the reference value irrespective of variation in load. However, for reduction mode of operation, the load variation causes fluctuations in the line voltage even when the ES is operating. This might be improved by making the circuit more inductive, which will assist the ES for reduction action. The basic single ES circuit was modified by adding an extra ES to it. It was observed that the reactive power consumption of each ES decreased by almost 50% for both modes of operation. Therefore we can conclude that as the number of ES in the circuit increases by a factor of ‘n’, the reactive power consumed by each ES to carry out the same magnitude of regulation decreases by a factor of ‘n’. This decreases the stress on each ES as well as the inverter rating for ES. For this study, the linear and identical loads have been considered, which can be further extended to non-linear and non-identical loads. Also, the random load profile can be replaced with a real time load profile. P. P. Varaiya, F. F. Wu and J. W. Bialek, “Smart Operation of Smart Grid: Risk-Limiting Dispatch,” in Proceedings of the IEEE, vol. 99, no. 1, pp. 40-57, Jan. 2011. D. Westermann and A. John, “Demand Matching Wind Power Generation With Wide-Area Measurement and Demand-Side Management,” in IEEE Transactions on Energy Conversion, vol. 22, no. 1, pp. 145-149, March 2007. P. Palensky and D. Dietrich, “Demand Side Management: Demand Response, Intelligent Energy Systems, and Smart Loads,” in IEEE Transactions on Industrial Informatics, vol. 7, no. 3, pp. 381-388, Aug. 2011. A. Mohsenian-Rad, V. W. S. Wong, J. Jatskevich, R. Schober, and A. Leon-Garcia, “Autonomous demand-side management based on gametheoretic energy consumption scheduling for the future smart grid,” IEEE Trans. Smart Grid, vol. 1, no. 3, pp. 320–331, Dec. 2010. 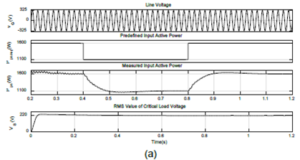 This paper presents a comparison of half bridge and full bridge isolated, soft-switched, DC-DC converters for Electrolysis application. An electrolyser is a part of renewable energy system which generates hydrogen from water electrolysis that used in fuel cells. A DC-DC converter is required to couple electrolyser to system DC bus. The proposed DC-DC converter is realized in both full-bridge and half-bridge topology in order to achieve zero voltage switching for the power switches and to regulate the output voltage. Switching losses are reduced by zero voltage switching. Switching stresses are reduced by using resonant inductor and capacitor. The proposed DC-DC converter has advantages like high power density, low EMI, reduced switching stresses, high circuit efficiency and stable output voltage. 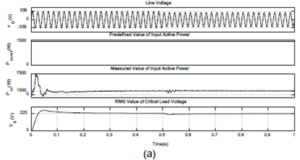 The MATLAB simulation results show that the output of converter is free from the ripples and regulated output voltage and this type of converter can be used for electrolyser application. 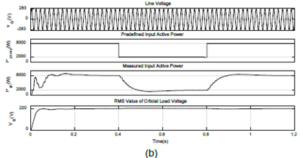 Experimental results are obtained from a MOSFET based DC-DC Converter with LC filter. The simulation results are verified with the experimental results. Fig 1. Half Bridge DC-DC Converter. Fig 2. Full Bridge DC-DC Converter. A comparison of half bridge and full bridge isolated DC-DC converters for Electrolysis application are presented. DC-DC converters for electrolyser system is simulated and tested with LC filter at the output. The electrical performances of the converter have been analyzed. The simulation and experimental results indicate that the output of the inverter is nearly sinusoidal. The output of rectifier is pure DC due to the presence of LC filter at the output. Switching losses are reduced by zero voltage switching. Switching stresses are reduced by using resonant inductor and capacitor The advantages of resonant converter are reduced (di/dt), low switching losses and high efficiency. Switching losses are reduced by zero voltage switching. Switching stresses are reduced by using resonant inductor and capacitor The converter maximizes the efficiency through the zero voltage switching and the use of super-junction MOSFET as switching devices with high dynamic characteristics and low direct voltage drop. Half bridge converter is found to be better than that of full bridge converter. E.J.Miller, “Resonant switching power conversion,”in Power Electronics Specialists Conf.Rec., 1976, pp. 206-211. V. Volperian and S. Cuk , “A complete DC analysis of the series resonant converter”, in IEEE power electronics specialists conf. Rec. 1982, pp. 85-100. R.L. Steigerwald, “High-Frequency Resonant Transistor DC-DC Converters”, IEEE Trans. On Industrial Electronics, vol.31, no.2, May1984, pp. 181-191. D.J. Shortt, W.T. Michael, R.L. Avert, and R.E. Palma, “A 600 W four stage phase-shifted parallel DC-DC converter,”, IEEE Power Electronics Specialists Conf., 1985, pp. 136-143. V. Nguyen, J. Dhayanchand, and P. Thollot, “A multiphase topology series-resonant DC-DC converter,” in Proceedings of Power Conversion International, 1985, pp. 45-53. This paper deals with a multi objective control technique for integration of distributed generation (DG) resources to the electrical power network. The proposed strategy provides compensation for active, reactive, and harmonic load current components during connection of DG link to the grid. The dynamic model of the proposed system is first elaborated in the stationary reference frame and then transformed into the synchronous orthogonal reference frame. The transformed variables are used in control of the voltage source converter as the heart of the interfacing system between DG resources and utility grid. By setting an appropriate compensation current references from the sensed load currents in control circuit loop of DG, the active, reactive, and harmonic load current components will be compensated with fast dynamic response, thereby achieving sinusoidal grid currents in phase with load voltages, while required power of the load is more than the maximum injected power of the DG to the grid. 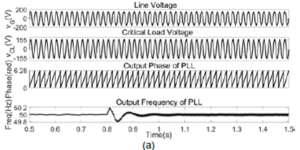 In addition, the proposed control method of this paper does not need a phase-locked loop in control circuit and has fast dynamic response in providing active and reactive power components of the grid-connected loads. The effectiveness of the proposed control technique in DG application is demonstrated with injection of maximum available power from the DG to the grid, increased power factor of the utility grid, and reduced total harmonic distortion of grid current through simulation and experimental results under steady-state and dynamic operating conditions. Fig. 1. General schematic diagram of the proposed control strategy for DG system. Fig. 2. Load voltage, load, grid, and DG currents before and after connection of DG and before and after connection and disconnection of additional load into the grid. Fig. 3. Grid, load, DG currents, and load voltage (a) before and after connection of additional load and (b) before and after disconnection of additional load. Fig. 4. Phase-to-neutral voltage and grid current for phase (a). Fig. 5. Reference currents track the load current (a) after interconnection of DG resources and (b) after additional load increment. Fig. 6. Load voltage, load, grid, and DG currents during connection of DG link to the unbalanced grid voltage. A multi objective control algorithm for the grid-connected converter-based DG interface has been proposed and presented in this paper. Flexibility of the proposed DG in both steady-state and transient operations has been verified through simulation and experimental results. Due to sensitivity of phase-locked loop to noises and distortion, its elimination can bring benefits for robust control against distortions in DG applications. Also, the problems due to synchronization between DG and grid do not exist, and DG link can be connected to the power grid without any current overshoot. One other advantage of proposed control method is its fast dynamic response in tracking reactive power variations; the control loops of active and reactive power are considered independent. By the use of the proposed control method, DG system is introduced as a new alternative for distributed static compensator in distribution network. The results illustrate that, in all conditions, the load voltage and source current are in phase and so, by improvement of power factor at PCC, DG systems can act as power factor corrector devices. The results indicate that proposed DG system can provide required harmonic load currents in all situations. Thus, by reducing THD of source current, it can act as an active filter. The proposed control technique can be used for different types of DG resources as power quality improvement devices in a customer power distribution network. T. Zhou and B. François, “Energy management and power control of a hybrid active wind generator for distributed power generation and grid integration,” IEEE Trans. Ind. Electron., vol. 58, no. 1, pp. 95–104, Jan. 2011. M. Singh, V. Khadkikar, A. Chandra, and R. K. Varma, “Grid interconnection of renewable energy sources at the distribution level with power quality improvement features,” IEEE Trans. Power Del., vol. 26, no. 1, pp. 307–315, Jan. 2011. M. F. Akorede, H. Hizam, and E. Pouresmaeil, “Distributed energy resources and benefits to the environment,” Renewable Sustainable Energy Rev., vol. 14, no. 2, pp. 724–734, Feb. 2010. C. Mozina, “Impact of green power distributed generation,” IEEE Ind. Appl. Mag., vol. 16, no. 4, pp. 55–62, Jun. 2010. B. Ramachandran, S. K. Srivastava, C. S. Edrington, and D. A. Cartes, “An intelligent auction scheme for smart grid market using a hybrid immune algorithm,” IEEE Trans. Ind. Electron., vol. 58, no. 10, pp. 4603–4611, Oct. 2011. Solar energy is radiant light and heat from the Sun. It is harnessed using a range of ever-evolving technologies. Such as solar heating, photovoltaics, solar thermal energy, solar architecture, molten salt power plants and artificial photosynthesis. It is an important source of renewable energy and its technologies are broadly characterized as either passive solar or active solar. Depending on how they capture and distribute solar energy or convert it into solar power. Active solar techniques include the use of photovoltaic systems, concentrated solar power and solar water heating to harness the energy. Passive solar techniques include orienting a building to the Sun. Selecting materials with favorable thermal mass or light-dispersing properties, and designing spaces that naturally circulate air. In 2011, the International Energy Agency said that “the development of affordable, inexhaustible and clean solar energy technologies will have huge longer-term benefits. It will increase countries’ energy security through reliance on an indigenous, inexhaustible and mostly import-independent resource, enhance sustainability, reduce pollution, lower the costs of mitigating global warming, and keep fossil fuel prices lower than otherwise. These advantages are global. Hence the additional costs of the incentives for early deployment should be considered learning investments; they must be wisely spent and need to be widely shared”.